Consider two views about sustainable cities. Call one the Green City, and the other the Compact City. Green City: A sustainable city is a green city. It has lots of plants and trees that make the city more beautiful, provide habitat for wildlife, and help clean the air and water. It even has community gardens where people grow food and flowers. Compact City: A sustainable city is a compact city. It has lots of buildings and activities conveniently close together so people can walk, bike, and take transit. It even has paved squares and plazas where people gather and participate in markets, performances, free speech, and recreation. The Green City is popular as never before. Everyone wants more trees, more landscaping, more living green in their neighborhoods. Stormwater standards are shaping up to be the major vector by which the Green City is delivered — even mandated, in many cases. What does this mean for the Compact City? Is there a conflict between the two views? In fact, both views are necessary. 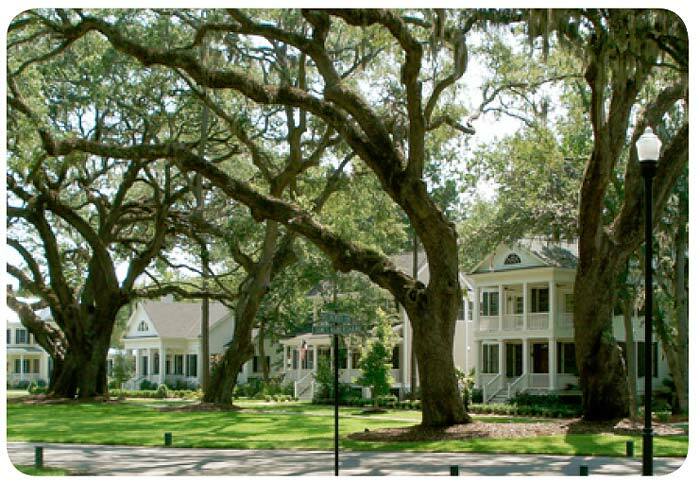 We have the technical know-how to create neighborhoods that are both compact and green. But sometimes standards and regulations don’t recognize this, particularly stormwater standards. Well-intentioned stormwater standards and regulations can put compact urban development at a disadvantage. They may have the unintended consequence of promoting sprawl, which hurts watersheds more than compact development. Unlike many barriers to compact development, this is not a technical, social, financial, or even political problem. It is largely an administrative problem. Doing the right thing is simply more difficult for administrators. On natural land, the soil and vegetation soak up rainwater and stormwater. Plants and trees grow, and the soil gradually releases the water. But on developed land, water behaves differently. On developed land with paved and built surfaces (known as “impervious surfaces”), the water doesn’t soak into the ground as much. Instead, it flows over the surface. Flowing water from precipitation (known as “runoff”) must be handled properly; otherwise it will cause flooding and erosion, and will pollute and damage streams, lakes, and rivers. In the midst of the post-World War II building boom, researchers and government agencies started noticing the stormwater impacts of rapid, sprawling development (Rome, 2001). Surveys in the late 1950s found that suburban development practices and patterns led to more frequent and severe flooding than regulations had anticipated. Impacts like erosion, landslides, and septic tank failure were also troubling. Agencies and engineers soon developed stormwater mitigation guidelines, and by the early 1970s subdivisions began incorporating the recommendations. The guidelines called for slowing and storing stormwater (for example, with buffers, swales, and impoundment ponds) and preservation of open space (for example, natural stream beds and floodplains). These features have become ubiquitous in present-day development regulations. They have become mainstream. The legacy is a strong bias against urban density. The mainstream of stormwater engineering and administration sees urbanization as the culprit: a condition to be penalized and barely tolerated. A subset of BMPs is low-impact design (LID) or environmentally sensitive design (ESD). The goal of LID is to emulate the stormwater function that a site had in its natural state, before it was touched by humans. LID techniques can include green roofs, cisterns, rain gardens, permeable pavement, and swales. LID techniques are extremely popular in the field of landscape design today, and for good reason. They are usually less costly than conventional practices and often perform better. Regulators are moving to require these techniques in all land development regulations. For many practitioners, LID represents the essence of sustainable urbanism – the melding of biophilia, aesthetics, ecological performance, and habitat protection. But the universal and inflexible application of BMPs and LID can have significantly negative consequences on the quality of urban places and the health of watersheds. LID purports to encourage smart growth and urban redevelopment, but as a rule this support is nominal, little more than lip service. In general practice, LID puts urban density at a competitive disadvantage. The best way to reduce stormwater impacts is well-designed urban density in conjunction with regional planning that preserves natural land. Compact, walkable urbanism is by far the best performer on a per-capita basis, and can be a superior performer on a per-neighborhood and per-watershed basis. But most stormwater standards and regulations pursue the Green City and disfavor the Compact City. They promote green-yet-low-density development — green sprawl, so to speak. At the larger regional scale, this has the opposite effect than intended, and results in greater damage to the watershed. Thus the stormwater regulatory regime in the U.S. can be self-contradictory and even self-defeating. Four principles can help correct this unfortunate and unnecessary situation. 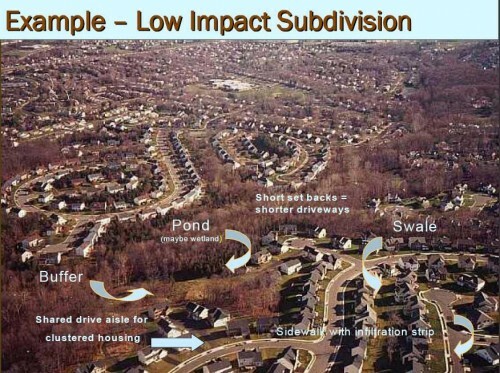 Many experts and organizations have confirmed that dense development reduces per-capita stormwater impacts, and thus can dramatically reduce the total impact on watersheds. A great introduction to this idea is the EPA’s Smart Growth page on water. Two EPA reports are highly relevant and have been widely cited. Protecting Water Resources with Higher-Density Development makes the case for planning a variety of densities to better manage stormwater. A simple mathematical model compares development at 1 dwelling per acre with development at 8 dwellings per acre. 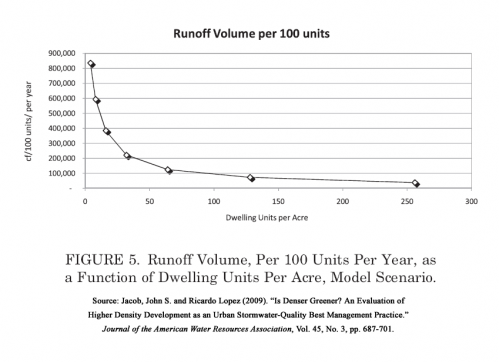 The model shows that higher density reduces the runoff per dwelling by 73 percent. Building the same number of houses at the higher density reduces impervious surfaces by 60 percent. A first step is to plan for strategic preservation of continuous tracts of open space. Second, preservation of critical ecological areas such as riparian corridors, stream buffers, flood plains, and wetlands is needed. 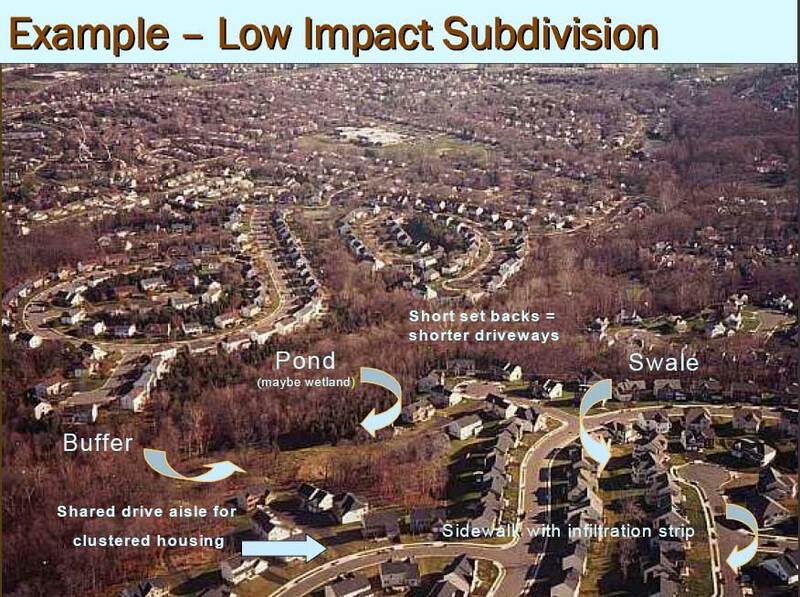 These parcels are of critical importance in developed areas to absorb and filter stormwater. Third, for land that is to be developed, smart growth strategies such as higher density and more compact development serve to disturb less land and accommodate more development. The models show that improvements in per-dwelling pollutant load start at 4-12 dwellings per acre. Dramatic improvements in per-dwelling runoff volume start at 4 dwellings per acre and begin to level out at around 20-30 dwellings per acre. The increase in benefits is less dramatic above those densities. Many historic, 2-4 story city neighborhoods exist at those densities, like Alexandria, VA, or Oak Park, IL, or the French Quarter in New Orleans. Housing types in those places may be a mix of single-family, rowhouse, and low-rise multifamily buildings. Developments are usually required to manage their stormwater on-site, which means that site boundaries are all-important to the administration of stormwater regulations. The boundary of a site may delineate a single lot with a single building. Or the boundary of a site may encompass an entire neighborhood with hundreds of lots and buildings. This has huge implications for the design and application of stormwater BMPs. Large, neighborhood-scale projects inherently have more options. They can use shared solutions — BMPs within their public spaces, streets, and parks — to receive and absorb runoff. 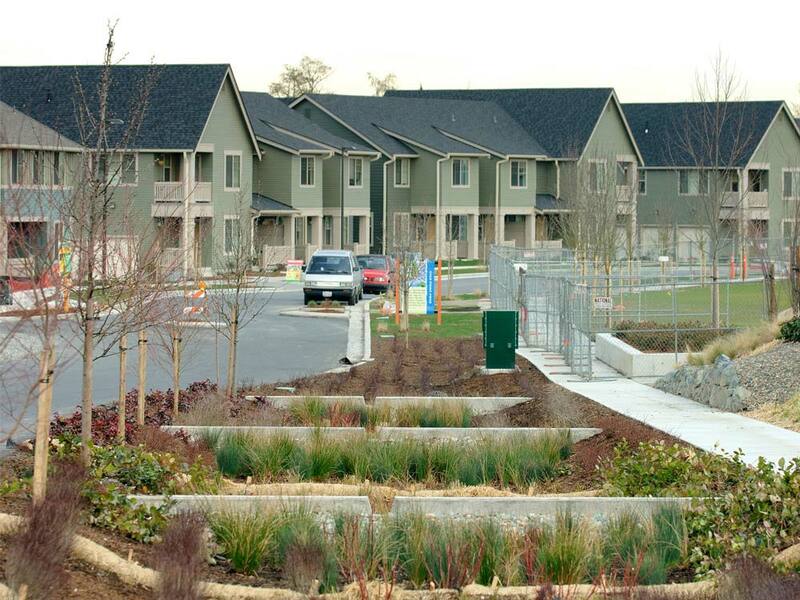 The High Point development in Seattle, WA, has won numerous awards as a exemplary model of smart growth, receiving special praise for its stormwater management. 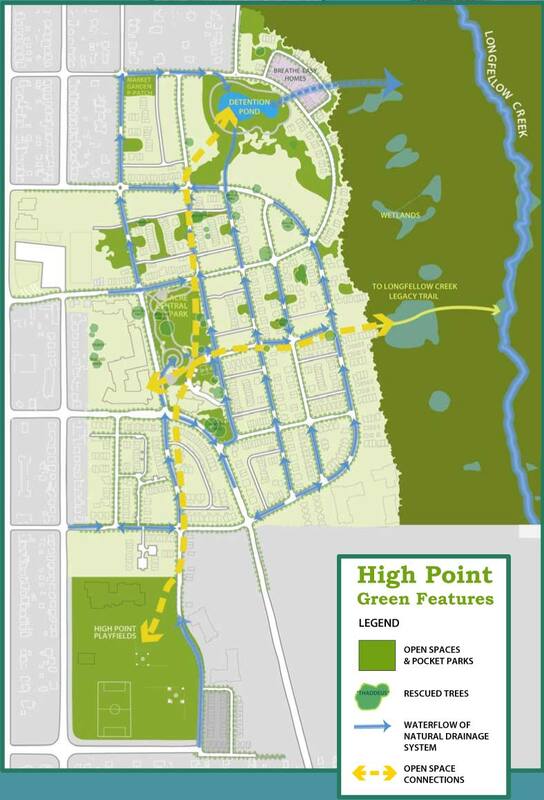 High Point also provides affordable housing, mixed use, walkability, brownfield redevelopment, and new parks and gardens. High Point features an elaborate three-part stormwater system: (1) lot-level BMPs include furrows, dispersion trenches, rain gardens, and pervious pavements; (2) block-level BMPs include swales and berms which also serve as pedestrian crossing points; and (3) a community-level stormwater pond and parks. The system removes 80 percent of total suspended solids, reduces runoff from 2-year storm events to predevelopment volumes, and controls the peak flow from 100-year storm events. Stormwater infrastructure incorporated into street types calibrated to the Transect. The project did not win the Houston Land/Water Sustainability Forum competition, but it did win a CNU Charter Award in 2010. 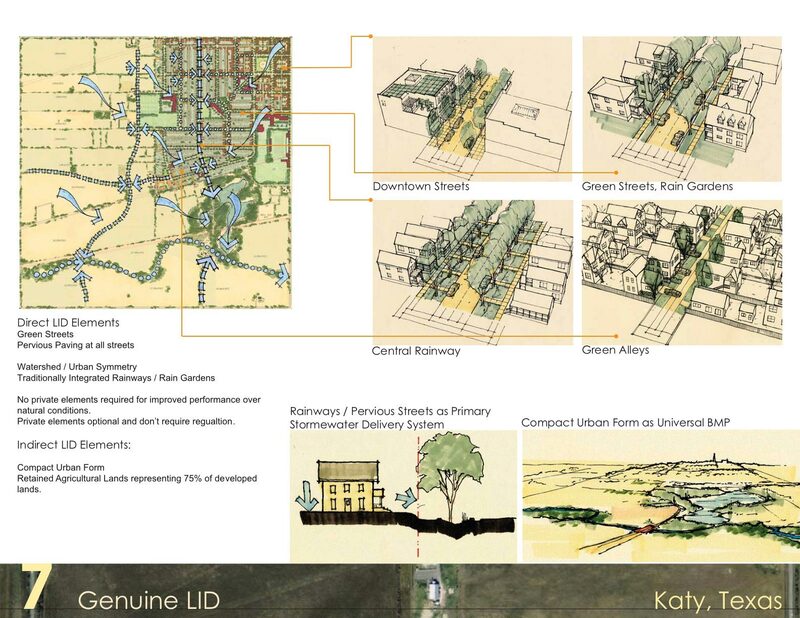 Image credit: Dreiling Terrones Architecture and Crabtree Group Inc.
High Point and the Katy competition entry work because they are large sites that can employ shared solutions. But when mainstream stormwater standards and regulations are applied to individual lots within larger areas, even moderately dense neighborhoods like High Point and Katy become impossible. … on-site stormwater management controls are often recommended as the preferred means of stormwater management, although they tend to encourage lower-density development patterns. And while they are easily implemented and regulated given the incremental, site-by-site development that is typical of most urban growth, monitoring and maintenance can be expensive and difficult for both the individual property owner and the regulating authority. A small urban project, such as a single building that occupies all of its lot, doesn’t have the option of shared solutions. 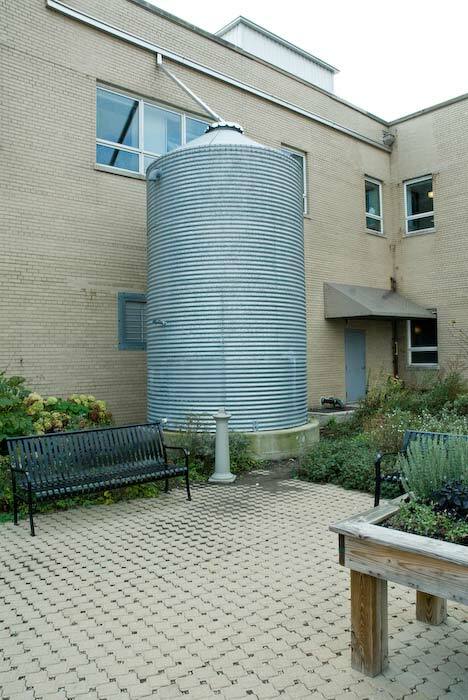 It is forced to use more expensive or intrusive BMPs such as green roofs, cisterns, or above-ground tanks. Thus, it is put at a cost disadvantage or functional/operational disadvantage despite its superior per-capita performance. Larger sites with more vegetated ground and open space have cheaper stormwater options available, such as swales, rain gardens, and ponds. Setting overly ambitious or costly goals for urban streams may result in the perverse consequence of causing more waters to fail to meet [standards]. For example, consider efforts to secure ambitious [standards] in highly developed areas or in an area slated for future high-density development. Regulatory requirements and investments to limit stormwater quantity and quality through open-space requirements, areas set aside for infiltration and water detention, and strict application of maximum extent practicable controls have the effect of both increasing development costs and diminishing land available for residential and commercial properties. Policies designed to achieve exceedingly costly or infeasible [standards] in urban or urbanizing areas could have the net consequence of shifting development (and associated impervious surface) out into neighboring areas and watersheds. … In such a case, it might be sound water quality policy to accept higher levels of impervious surface in targeted locations, more stormwater-related impacts, and less ambitious [standards] in urban watersheds in order to preserve and protect designated uses in other watersheds. … if local governments are having a hard time attracting development to these vacant sites now, how are strict rules that make redevelopment even more expensive and difficult going to help? … For redevelopment, there is a regulatory sweet spot: pushing for as much on-site stormwater management as possible without tripping decisions that result in no improvement at all. Furthermore, stormwater regulations only apply to new construction and redevelopment, not to existing development. In other words, new and redeveloped sites are supposed to bear the entire burden of solving existing stormwater problems. This hits urban redevelopment projects especially hard. The net result of these well-intentioned but misguided policies is a watershed with more habitat lost to development, more impervious surface, and more impaired streams. Site-by-site review is the easiest and most common way to address stormwater because that is how the entire real estate industry is set up. Building permits, zoning changes and variances, traffic impact studies, building inspections, bank loans, investments, and property taxes — with few exceptions, these activities are administered on a site-by-site basis. Most local governments have a building permit department, but far fewer have a planning department. Planning for the health of an entire watershed is more complicated and less familiar. But site-level administration is an inferior and harmful method if the ultimate goal is good watershed health. Stormwater policy should not only allow off-site mitigation, in addition it should not penalize or disfavor off-site mitigation. A level playing field is the minimum requirement for smart growth objectives. When planning shared stormwater solutions, consider that BMPs are more effective the closer they are to the source of runoff. Close proximity allows the linkage between source and solution to be clearly visible. In the case of BMP failure or poor maintenance, a BMP can be traced back to its source. The evidence to date suggests that managing stormwater within the boundaries of a neighborhood can work well. The farther that runoff is shipped, the less environmentally effective the system overall. More distant receiving areas require more pipes and underground infrastructure, and may require more energy-intensive water pumping. For instance, Southern California imports most of its water. Water conveyance for Southern California requires more than 50 times the energy than it does for Northern California. In some areas like San Diego County, water conveyance constitutes several percent of the total electricity demand (Cohen et al., 2004). In some cases, off-site mitigation can perform adequately at distances that are farther than the immediate neighborhood. Cities with separated stormwater systems may have the capacity to pipe stormwater longer distances to receiving areas that can absorb runoff and its pollutants in sustainable ways. But as distances grow, the ability to monitor specific sources and link them to BMPs far downstream becomes more difficult. The extreme of off-site mitigation is when the physical link is broken entirely. Urban sites may have the option of paying into a fund instead of meeting strict on-site stormwater requirements. The fund is used to upgrade storm sewers or install BMPs elsewhere in the watershed. This approach requires careful tuning to avoid placing density and urban redevelopment at a cost disadvantage. Any fees should reflect the fact that dense urban sites have the lowest per-capita stormwater impact. Another popular idea is tradeable stormwater credits. Urban sites are given the option to purchase credits that in theory offset their stormwater impacts. The impacts of runoff in one location are traded for the absorbing capacity of another location, which may be in an entirely different region or watershed. This raises a lot of issues. Urban/high-density sites generally will pay, and suburban/low-density sites will get paid — setting up yet another bias in favor of sprawl. Who will verify that credit-producing buffers are preserved and that rain gardens, green roofs, and so on, are maintained over the long term? Without preservation and maintenance, the BMPs won’t perform as advertised. Will tradeable credits require a department of on-site inspectors making annual visits? When shared solutions are nearby to a site, BMP failure is easy to observe and trace back to individual sites. When credits are traded statewide, everything gets very abstract and hard to enforce. Tradeable credits have similar problems as carbon offsets — lots of optimistic talk, but sometimes subpar performance that just doesn’t get the job done. The intricacies and loopholes of credit trading are a bonanza for lawyers, though. Great neighborhoods have a variety of streets and blocks with different kinds of character, serving a broad range of real estate market desires. Some people like homes with generous yards and gardens, set on quiet streets with no retail businesses. Some people prefer houses with only a small patio or terrace to maintain, set in main street environments with a range of shops and services nearby. And some like apartment living with downtown intensity, in neighborhoods with nightlife or major cultural venues and institutions nearby. The goal of Transect-based planning is to serve a variety of preferences for urban environments, delivered in neighborhoods that are compact and complete. Each environment has an identifiable character that results from the coordination of urban design elements in an internally consistent manner. These environments are called Transect zones, and they range in size from a few acres to tens of acres. Good neighborhoods are composed of three or more Transect zones. 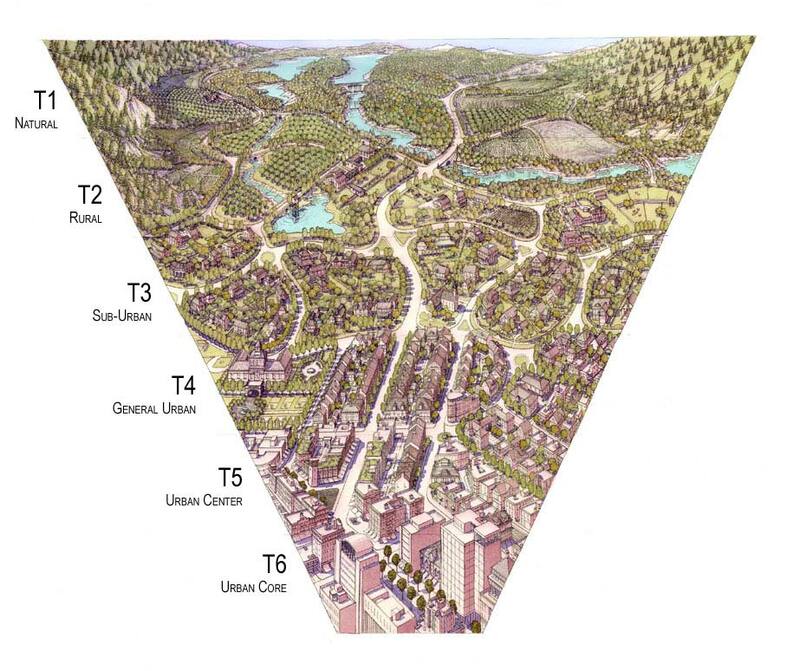 The above illustration of a generic traditional town shows that denser, more intensive Transect zones (T5 and T6) occupy a relatively small percentage of land within a neighborhood or town. The majority of land in a traditional neighborhood or town is occupied by T1 through T4 zones. Paul Crabtree of Crabtree Group has developed an innovative and promising approach to Transect-based stormwater planning. The key is that lower-intensity zones can easily retain and absorb stormwater, while in higher-intensity zones the difficulty and cost of retaining stormwater is much greater. 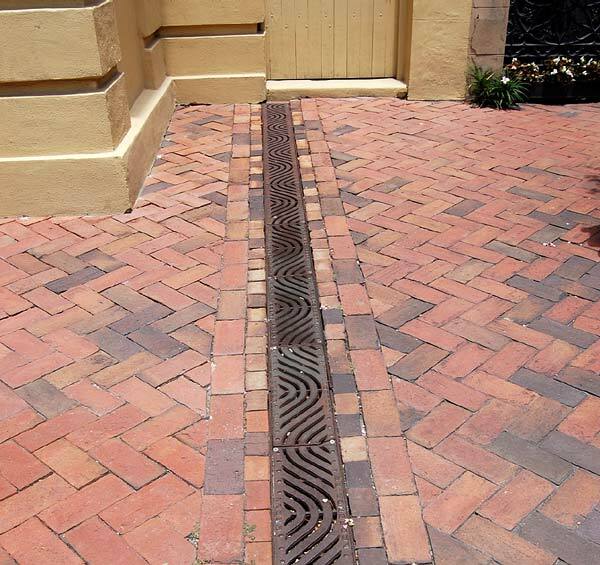 Lower-intensity zones can retain extra stormwater, thereby balancing the runoff generated by higher-intensity zones. Crabtree has implemented this approach in plans such as Wharton Town Center in South Fork, CO (adopted in June 2009) and the Regional Watershed Management Plan for the towns of Westcliffe and Silver Cliff, CO. For the aforementioned Houston Land/Water Sustainability Forum competition entry, Crabtree used this approach to plan stormwater infrastructure and model its impacts. The table below illustrates the conceptual basis of this method. To understand the table, a word needs to be introduced. Engineers describe stormwater using characteristics such as runoff volume, time of concentration, and peak flow. The alteration of these characteristics is called hydromodification. The difficulty of stormwater retention in various Transect zones (top row) corresponds to the hydromodification that is required to be reduced, or that is allowed to be added (bottom row). 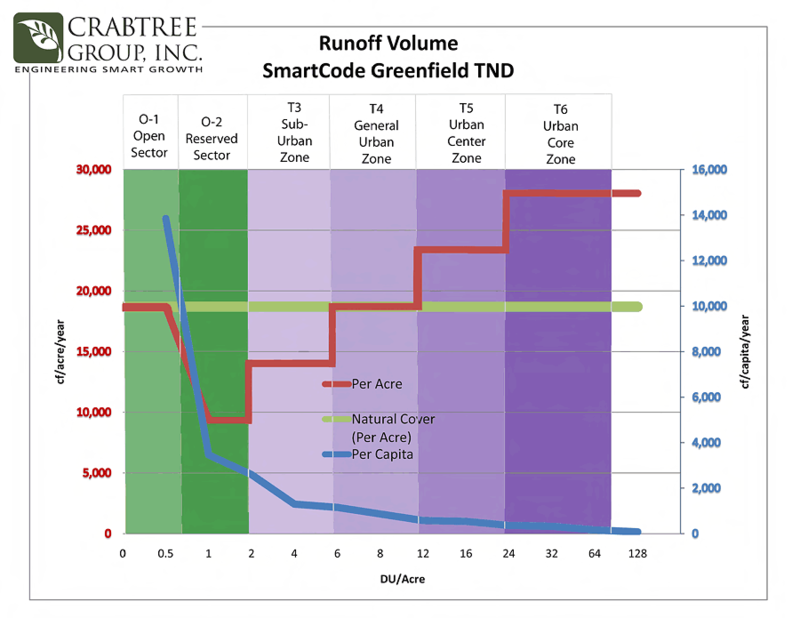 The T2 and T3 zones are required to retain more runoff than the “natural land” condition would. The T5 and T6 zones are allowed to have greater stormwater impacts than the “natural land” condition. The T4 zone represents the balance point where runoff characteristics must be equal to the “natural land” condition. Image credit: Crabtree Group, Inc.
To put the idea into practice, the stormwater engineer calculates multiplication factors for each Transect zone. The table below shows generic multiplication factors for a greenfield new urbanism development. Table of generic multiplication factors. No development is allowed in T1; no storage is required in T5 and T6. The designer, developer, or builder uses the multiplication factors to determine the actual storage requirements. One would multiply the area of impervious surface added (in square feet) by the multiplication factor to determine cubic feet of stormwater storage required. The transect multipliers are derived both theoretically and empirically through an iterative process. … we run the hydrology model to test the performance of the watershed so that there is either no overall watershed impact due to community development, or that the hydrology of the watershed is actually improved by the development … We also test the multipliers on a few actual sites in different Transect zones to make sure they can be accomplished without denigrating the urbanism realm of the Transect for the site. This tuning process is iterative until we obtain a set of multipliers that perform well both theoretically and empirically both for the watershed and the pedshed. The net result is a watershed hydrology regulation that improves the hydrology of the watershed and supports existing and improved urbanism. Crabtree has also written a Regional Watershed module for the SmartCode (a Transect-based, open-source model zoning code) that enables this scheme for the community and regional scales. When discussing the minutiae of environmental policies and practices, it’s all too easy to overlook the elements that makes urbanism pleasurable to live in — especially beauty and delight. Throughout history, the greatest towns and cities were designed with beautiful vistas and spaces intended to delight their inhabitants. The treatment of water was no exception, and craftsmen and landscapers often created parks, canals, and fountains that were works of art in their own right. Today, the role of beauty in place making is denigrated. Some philosophies even propose that beauty is in the eye of the beholder, a purely individual response. But beauty is not so hard to identify. People enjoy urban environments of high aesthetic quality, and show their preference by popularizing those places. Beautiful, walkable streets and neighborhoods are in greater demand, visited more often, and valued more highly. 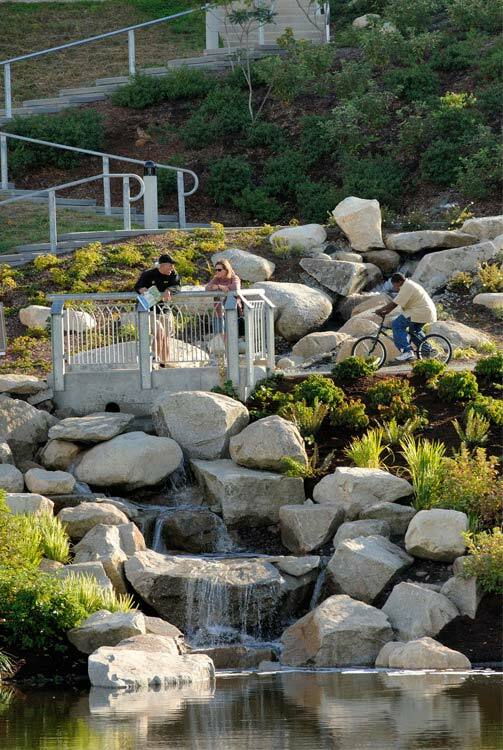 Beauty and delight are important contributors to a good quality of life, and more so when combined with functional purposes such as stormwater management. A system that marries traditional neighborhood design with environmentally sensitive stormwater management is Light Imprint, developed by Tom Low of the Duany Plater-Zyberk & Company Charlotte office. 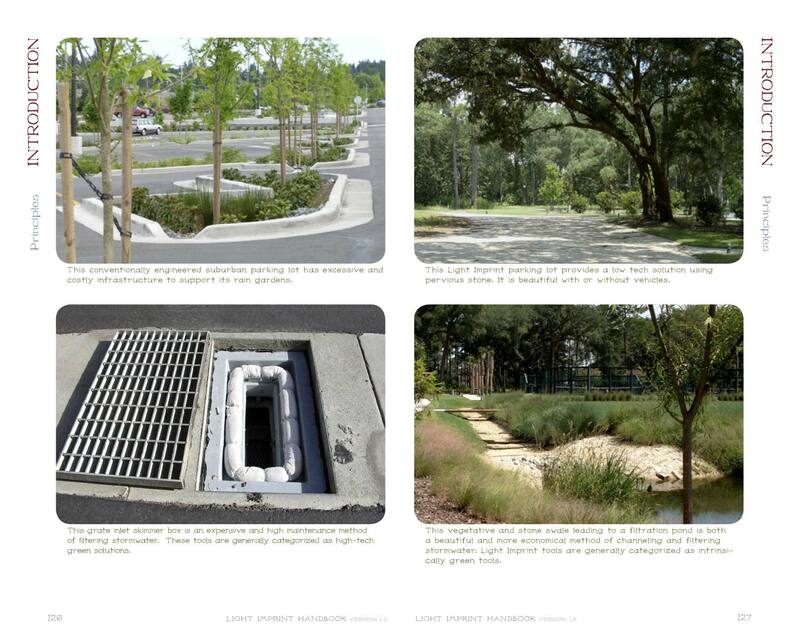 The Light Imprint Toolbox Matrix presents a wide range of stormwater solutions, and allocates each one to the Transect zones it is best suited for. For instance, a wide, grassy swale is suitable for a T3 street frontage, but not for a T6 downtown setting. Masonry water channels and elaborately artistic fountains can be wonderful in a T5 town or village center, but are less suitable for T2 rural roadway frontages. Spread from the Light Imprint Handbook compares LID vs. Light Imprint treatments of commercial and residential frontages. Spread from the Light Imprint Handbook compares LID vs. Light Imprint treatments of parking and drainage. Finally, without intensive calibration, LID may actually prevent sustainable development. Many of its standards and practices involve lot-based, rather than block- or neighborhood-based, solutions; that increases the need for large lots. For instance, despite their environmental benefits, putting rain gardens in front of houses increases the front setback significantly. To foster walkable urbanism, the houses need to be close to the sidewalk. … compact development suffers when the BMP techniques result in stormwater detention areas in front of or beside buildings. This approach prevents social connectivity. In addition, shop owners find that detention areas in front of their buildings interfere with the customers’ access to goods and services. The zealous and unidimensional insertion of green space in all contexts and in all situations degrades the pedestrian functionality of heavily trafficked spaces. It disperses buildings into more scattered patterns, creating awkward obstacles to the flow of foot traffic, and preventing the continuous, spatially defining frontages needed for successful pedestrian-oriented retail. Inserting green space into the most intensively urban places regardless of design or context makes walking more inconvenient — precisely where it is most desirable. Furthermore, some types of BMPs are more prone to wear and tear when placed in intensively urban environments. Downtown streets are a tough environment for plants, as they face challenges like high foot traffic, mechanical damage, deposits of grit, salt and particulates, and litter accumulation. Porous pavement requires more frequent cleaning in high-traffic urban areas; otherwise it will clog up and stop functioning as designed. Green stormwater solutions must be allocated by context in order to meet the functional requirements of good urbanism: pedestrian-oriented frontages, walkability, viable retail, active civic spaces (such as squares and plazas), close proximity to mixed use and daily activities, and so on. It seems like no matter the regulation or rule, sprawl gets easier and redevelopment gets harder, whether it’s finance, stimulus, or stormwater. Urban areas face standards to re-create natural areas, while new development gets to deface nature as long as the spreadsheet works out. A few innovative regulations point the way towards common sense and relief. The West Virginia statewide stormwater permit reduces requirements for projects that are redevelopment, high-density development, or transit-oriented development. In Ventura County, CA, projects may be exempted from on-site requirements if they discharge to a storm drain, or if they are redevelopment in the urban core and do not alter preproject site runoff characteristics. Policies like these are promising starts; they should be monitored and tested to find out if they are encouraging smart growth and development density. The EPA’s Water Quality Scorecard evaluates municipal stormwater management policy. It includes green infrastructure policies as well as a wide range of smart growth policies that reduce stormwater impacts. 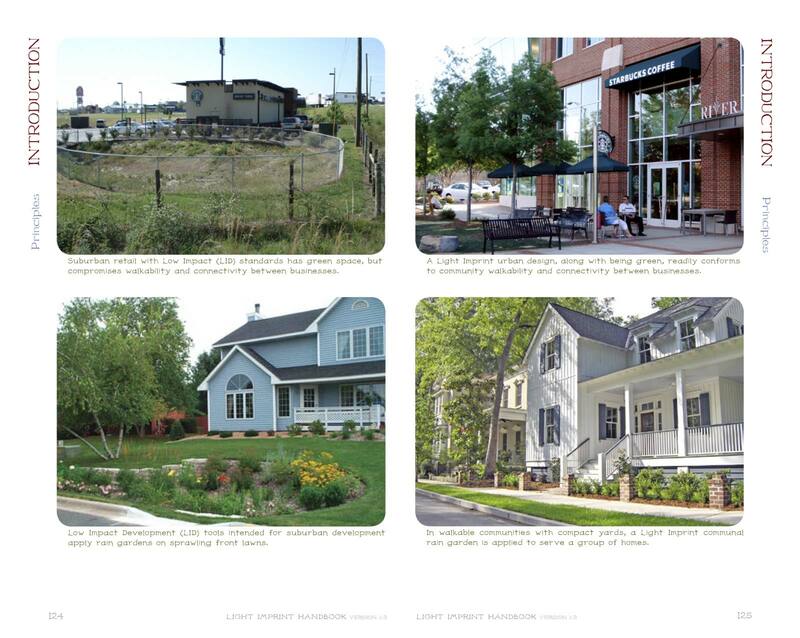 The Scorecard looks at policy at the site, neighborhood, and regional scales, and it also gives credit to policies that support off-site and shared stormwater solutions. Finally and not least, research and policies should emphasize design quality. Many of the great models from history, both large and small, are still relevant today; designers can draw upon the global heritage of urban water infrastructure made for delight and aesthetic refreshment. Stormwater should not be a green chore, but a celebration of the natural and manmade in combination: the dual ingredients of the uniquely human habitat of towns and cities. Cohen, Ronnie, Barry Nelson and Gary Wolff, Energy Down the Drain: The Hidden Costs of California’s Water Supply. Natural Resources Defense Council and Pacific Institute, August 2004. 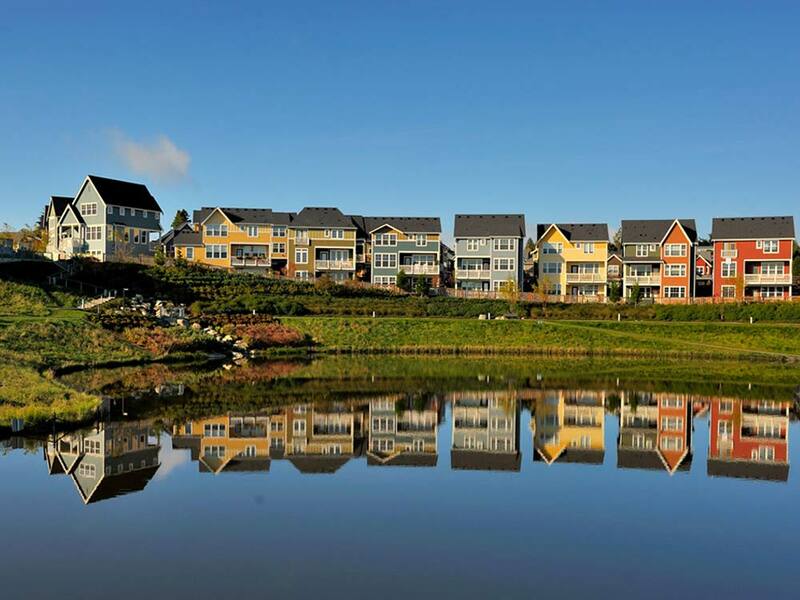 Crabtree, Paul, Principles of Smart Growth and Their Corresponding Rainwater Dos and Dont’s. Stormwater, March/April 2010. Goonetillekea, Ashantha, et al., Understanding the role of land use in urban stormwater quality management. Journal of Environmental Management, Volume 74, Issue 1, January 2005, pages 31-42. See also an archived copy. Harbor, J., et al., A Comparison of the Long-Term Hydrological Impacts of Urban Renewal versus Urban Sprawl. US EPA, Proceedings, National Conference on Tools for Urban Water Resource Management & Protection, February 7-10, 2000, pp. 192-197. Hirschman, David J. and John Kosco, Managing Stormwater in Your Community: A Guide for Building an Effective Post-Construction Program. Ellicot, MD: Center for Watershed Protection, July 2008. Jacob, John S. and Ricardo Lopez, Is Denser Greener? 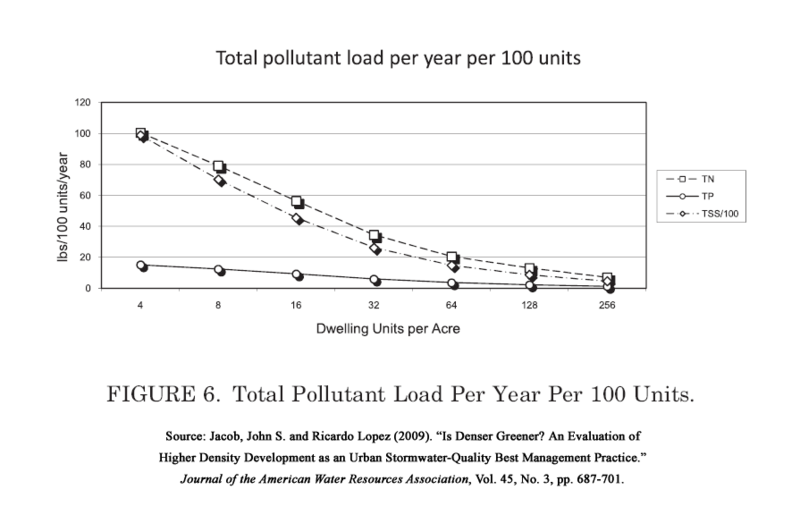 An Evaluation of Higher Density Development as an Urban Stormwater-Quality Best Management Practice. Journal of the American Water Resources Association, Vol. 45, No. 3, 2009, pp. 687-701. See also an archived version. Kloss, Christopher and Crystal Calarusse, Rooftops to Rivers: Green Strategies for Controlling Stormwater and Combined Sewer Overflows. Washington, DC: Natural Resources Defense Council, June 2006. Langdon, Philip, Natural drainage systems can cut NU’s development costs. New Urban News, January/February 2007. Lehner, Peter H. et al., Stormwater Strategies: Community Responses to Runoff Pollution. Natural Resources Defense Council, May 1999; revised October 2001. Low, Thomas E., Light Imprint Handbook: Integrating Sustainability and Urban Design. Version 1.3. New Urban Press, 2008. Low, Thomas E., Light Imprint Urbanism — A Framework for Urban and Environmental Sustainability. Paper presented at Congress for the New Urbanism XVI, Austin, TX, April 3-6, 2008. National Research Council, Urban Stormwater Management in the United States. Washington, DC: National Academies Press, 2009. Read online and order the hard copy at the National Academies web site. Nairn, Daniel, Stormwater Management should work with, not against, Smart Growth. Discovering Urbanism, July 7, 2009. Nisenson, Lisa, A Browner Shade of Green: The New Water Rules and the Next Chapter of Sprawl. Planetizen, June 11, 2007. Nisenson, Lisa, Sustainable Development or Green Sprawl? New Barriers to Infill. Presentation given at New Partners for Smart Growth Conference, Los Angeles, CA, February 2007. Nisenson, Lisa, Thou Shalt Review Ordinances…And Then What? Stormwater, October 2009. Rome, Adam, The Bulldozer in the Countryside: Suburban Sprawl and the Rise of American Environmentalism. Cambridge University Press, 2001. Schueler, Tom, The Reformulated Impervious Cover Model: Implications for Stream Classification. Technical Bulletin No. 3. Center for Watershed Protection, 2008. See also the summary article, The Reformulated Impervious Cover Model. Sorlien, Sandy, “All Green is Not Good: Sustainability by the Transect.” CNU Council Report VII: On Green Architecture and Urbanism. Gaithersburg, MD: The Town Paper, 2008, pp. 26-27. 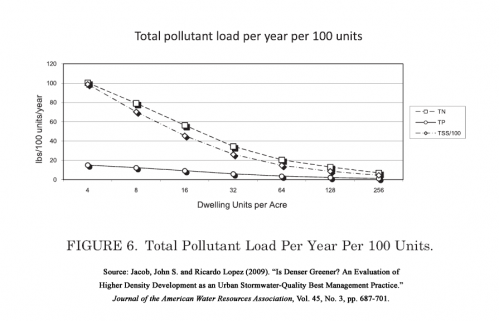 US EPA, Protecting Water Resources with Higher-Density Development. Lynn Richards, principal author. Washington DC: US EPA, January 2006. US EPA, Using Smart Growth Techniques as Stormwater Best Management Practices. Lisa Nisenson, principal author. Washington DC: US EPA, December 2005. US EPA, Water Quality Scorecard: Incorporating Green Infrastructure Practices at the Municipal, Neighborhood, and Site Scale. Abby Hall and Lynn Richards, principal authors. Washington DC: US EPA, October 2009. Thanks, John. Seeing as how you posted about Light Imprint just this morning, we are obviously thinking alike! Very informative article. Do you have specific examples of regulatory requirements pushing development outside of urban centers? I’d like to research this further. Thanks! Stephen, an example of higher costs for urban BMPs is presented in the study Comparison of Environmental Site Design to Conventional Site Design for Stormwater Management For Three Redevelopment Sites in Maryland. Selecting the cheapest options for each site, the study shows that urban sites have capital costs for BMPs that are 33% to 163% higher per square foot than suburban sites. An example of a regulatory requirement that is more difficult for urban sites is the International Green Construction Code. This model code requires retention of a 95th percentile rainfall event and all smaller storms, as well as restoring the pre-development runoff hydrology of the site. I disagree with some of the basic tenants of this article. The major one being the relationship between watershed quality and urban development density. 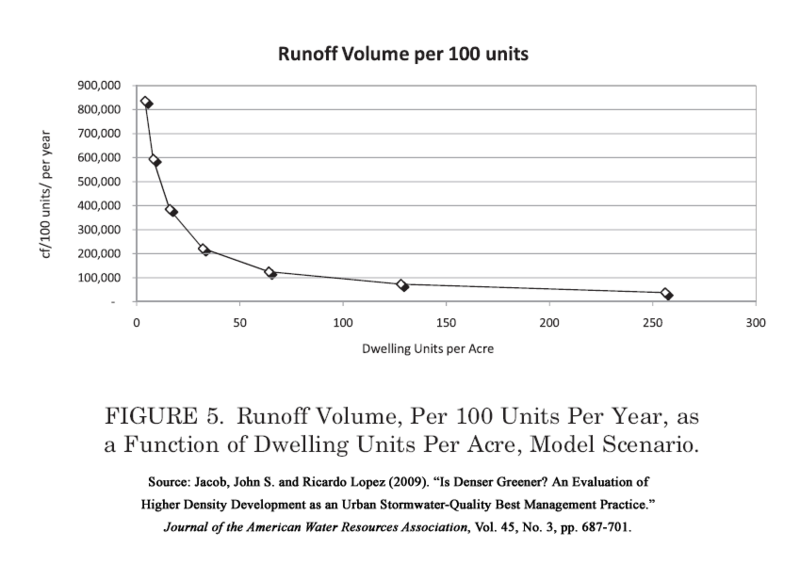 The density model seems to neglect the fact of what happens to drawdown and recharge on contained aquifers by this increased density model. I live in a county with a proposed rate of growth of 48% and drinking water is now being effected by this growth and it’s environmental side effects. We can’t find suitable places for new wells due to pollution and the density of existing neighborhoods. The density has also resulted in a need for the heavy salting of roads in winter months adding excessive sodium chloride to our drinking water. In the not too distant future urban sprawl will be a necessary evil in order to deliver safer drinking water because of the mistaken notion that density somehow protects our watersheds. There is a delicate balance which must be dealt with in the relationship between density the watershed and groundwater quality. Urban planning which touts density neglects this dynamic relationship. Michael, from your description it sounds like low density sprawl is harming the water quality in your county. I am guessing you would like to institute large-lot zoning across your entire county, so that no dense development could happen. But there are critical problems with that course of action. In car-dependent areas, two-thirds of impervious surface is roads and parking lots. And low-density development requires 3 to 4 times the roadway surface per capita than compact development. Furthermore, a lot of nitrogen water pollution comes from automobile air pollution, which is exacerbated by low density development. Planners are faced with the task of accommodating a certain increment of future growth. The question they must answer is, What pattern of growth results in the best water quality for the entire watershed? The truly environmental answer is to consider both the per-acre and per-capita impacts together. I agree there is a delicate balance between density in the watershed and groundwater quality. However, if we need to build a neighborhood for a given number of people, the evidence says higher density plus natural land preservation is the best pattern for watershed health. I am a planner in Ventura County. The new MS4 permit, Technical Guidance Manual, and hydromodification requirements do not allow an exemption from onsite requirements for redevelopment projects within the urban core. In fact, if an infill development project is unable to meet the 5% EIA requirements through onsite retention, it is saddled with a biofiltration multiplier of 1.5 for the remaining untreated volume. This is not an incentive for infill, but is easy for greenfield sprawl to achieve. In an excellent thesis, it is noted that new MS4 permits should allow credits for high density and infill, instead of increased biofiltration requirements when onsite retention is infeasible (pages 77, 82-84). Unfortunately, the current regulatory trend for additional hydromodification controls is trending towards an increased onsite BMP sizing requirement to retain a 10 year event. This will make infill projects even more disadvantaged. The current regulatory trend in California is towards even larger prescriptive volume requirements in conjunction with hydromodification design mandates. For example, the New Central Coast (California) MS4 permit requires 95th percentile storm event sizing for post-construction BMPs. Thanks for the update, WQ Planner. The language in the 2010 MS4 for Ventura County (p. 56) is the same as I reported in the essay. The language in the 2011 Technical Guidance Manual has no exemption for projects that discharge to storm drains. It has no exemption for projects that add a lot of impervious surface but maintain the same site runoff characteristics. It seems to be more restrictive than the MS4. The Technical Guidance Manual does provide pathways for offsite mitigation (pp. 2-19, 2-26, 2-27). Projects can either pay a fee, or they can provide offsite mitigation that is located in the same watershed. That’s similar to a suggestion I made in the essay. But I agree the 1.5 multiplier is unfair and unwarranted. It works to discourage urban infill and favor sprawl. The 2013 Draft Hydromodification Control Plan is closer to the MS4. Infill projects are exempt if the infiltration capacity of their pervious areas is not reduced. Does that mean pervious areas can be smaller so long as the overall site infiltration capacity is unchanged? The Hydromodification Control Plan shows maps of five urban areas in Ventura County where development is exempt because it discharges to storm drains, as stated in the MS4. In three other areas the status is still undetermined. Sorry to belabor the point, but page 56 of the MS4 permit exempts redevelopment or infill projects from hydromod., not the 95% EIA requirement. Page 51 clearly states that any redevelopment project above the 5,000 sq ft threshold must meet the 5% EIA requirement (page 52). I frequently am required to reject such projects, and it is disheartening. Again, I have seen firsthand many infill redevelopment projects rejected due to these requirements. Unfortunately offsite mitigation has not been feasible for anyone within the County. It requires land acquisition or an easement to ensure permanent use of the land for the LID BMP, permits from USACE, USFWS, Cal Department of Fish & Wildlife, and financial security to ensure that maintenance is performed in perpetuity. These are all additional costs that saddle infill development. While it sounds like a good idea, the reality is that not one single infill project has elected to do this – it just doesn’t financially work. If it did, infill developers would use it. But not one single project has elected to do so to date. WQ Planner, thanks for the clarification and further information. If I understand correctly, redevelopment projects in Ventura County may be exempt from controls on the flow, volume, and duration of stormwater runoff. But they are never exempt from the rule that 95% of the project area must be pervious or its runoff retained onsite. That is deeply unfortunate. The rigid impervious surface rule seems to make the exemptions for redevelopment pointless and ineffective. Earlier I said that policies should be monitored and tested to find out if they are encouraging smart growth and development density. Clearly the policies in Ventura County are not working to support smart growth. All of us who are concerned with these issues need to think about and propose policy changes that will encourage redevelopment along with adequate stormwater mitigation. One method that comes to mind immediately is government-owned parks and right-of-ways that can be used as shared stormwater mitigation areas. Other jurisdictions do this. The Staten Island Bluebelt, for example, is the largest municipally owned system of BMPs in the U.S. 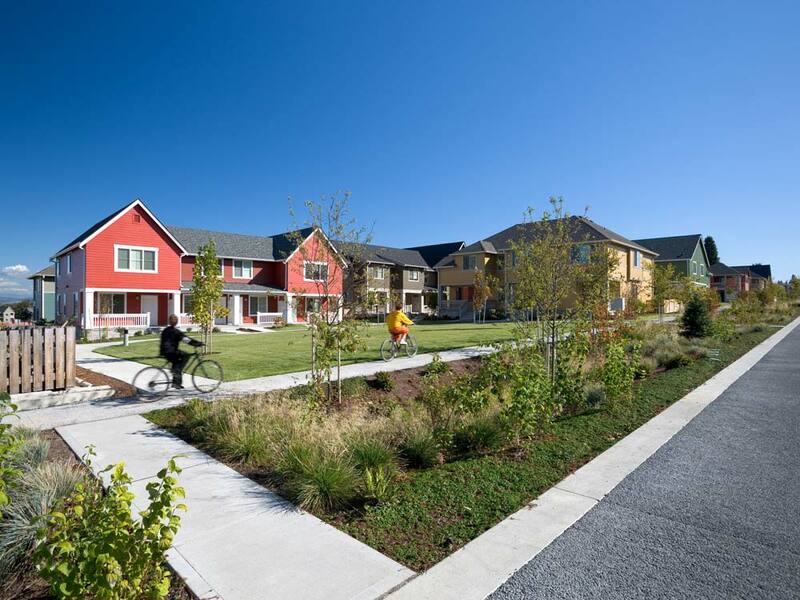 It happens to be dedicated to suburban residential neighborhoods, but similar facilities could certainly serve targeted redevelopment areas of denser infill. Lastly, section (c) defines the sizing requirement to: “infiltrate, store for reuse, or evapotranspire, without any runoff at least the volume of water that results from…” and proceeds to determine the strict sizing requirement for both new and redevelopment projects. Page 52 of the MS4 permit is critical, and as you note, deeply unfortunate. I have no idea why people like to use the Ventura MS4 permit as a model to help infill, because it does not. If you don’t believe me, read page 52 again, then because it is so full of regulatory jargon, you will have to read it a few more times. Then read the following comment letters from people who finance, design and build infill projects. Note that all of them repeat the same theme: the 5% EIA requirement creates a huge barrier to infill development. MS4 comment response, use control “f” to find every occurance of the word “infill”. This a long document, but shows an interesting trend: alternative compliance and the RPAMP option enabled to LARWQCB to brush aside these concerns and adopt the rigid 5% EIA rule universally applicable to both infill and greenfield projects. In my view, this is what happens when you have hundreds of pages of complicated requirements. The MS4 permit is 128 pages (not including appendices), the Technical Guidance manual is 594 pages long, and the new draft 2013 Hydromodification Control Requirements are 191 pages. That is almost 900 pages of technical information and regulatory gibberish. It is easy to understand how people misunderstand and misinterpret the actual requirements of this permit.